On Friday, November 18th, ECLA students organized a screening of short animation films called “TOONite”. The evening presented us with the challenge and pleasure of revisiting the perspective of a child, questioning our normal conception of reality and imagination. Thanks to the organizers, Jelena Ðjokic and Irina Stelea, we traveled to different parts of the world and through different time periods with film selections spanning from 1966 to 2010 and with representatives of Italian, French, Belgian, American, Japanese, Serbian and British animation. Most of us were introduced for the first time to animation techniques that are quite different from those of Disney, Pixar or DreamWorks. During those two hours we were enticed to doubt that animation films are simply for a child’s entertainment (if we ever thought so), and not a compelling medium to construct and reconstruct perceptions of reality. After “TOONite”, I managed to speak to Jelena about her own work, how this joint project came about, her choice in the selection, and the underlying idea uniting such different shorts. Initially Jelena wanted to gather the ECLA community to show her film, but she thought that it could also be a good opportunity for students and faculty to get together and see the works of other filmmakers. Many of the animations that we saw were well-known and received several awards in their field. The underlying idea for selecting the pieces was to visit different geographic locations and to become acquainted with various films that, “treat reality differently from feature films.” We saw many distinct techniques used for the creation of this “reality”, which in all cases challenged our perceptions. “TOONite” inevitably widened our horizon. The first film that we saw was La Linea, an episode from an animated series produced by Osvaldo Cavandoli in 1972. Jelena chose this piece because she thought that it would add to the AY Core seminar discussions from the previous week about Plato’s ‘divided line’ fromThe Republic. She also said that she has always been fascinated with how a single line might provoke us to constitute an entire and complete reality by relying solely on contours. 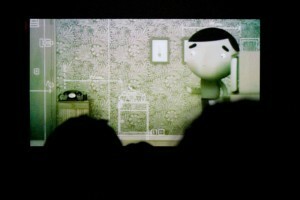 Furthermore, La Linea appeals purely to the human imagination, since “it overcomes language barriers”: the film does not represent a specific kind of animation, aimed at specific audience, particular to its time and genre, rather it puts its viewers on equal footing with regard to their capacity to create and construct what is not immediately offered to perception. La Linea was followed by a more recent film from 2009, Logorama, by the French animation collective H5. The animation is almost entirely assembled from logos and brands, which amount to more than 2500 different images. The piece critiques, or takes to the extreme, our own reality and we become more aware of how “branded” our world really is. The next movie, Chromophobia (Raoul Servais, Belgium, 1966) was the first film to treat the subject of World War II. It is an amazingly symbolic piece, which made us contemplate the idea that war erases all differences among individuals and deprives us of the “colors” of reality. There is a unified view of the world and it is monochromatic–black and white. Suffering is one and the same: there are degrees, perhaps, but not varieties. Guard Dog (Bill Plympton, USA, 2004) also sees the world from a single perspective: that of a dog wishing only to protect his master. This vantage point shapes and defines his reality. It is the perspective of emotion. “Plympton is all about emotion”, Jelena said, “and he tends to create an entire reality from a simple fact or something quite banal such as why a dog barks”. I highly recommend this short film to anyone who has wondered why the neighbor’s dog always barks at him or her. SuperCool (Goran Radovanovic and Jelena Ðjokic, Serbia, 2010) is a stop-motion animation created by five people in collaboration. It provides an answer to the question: “How would clothes grow…if they could grow?” Every piece of clothing has an information tag or a, “declaration about the material” and in the animation we see a cotton sock “grow” gradually from a tag that reads “cotton”. Jelena and Goran shot the film frame-by-frame in eight days using stop-motion techniques, making about 7000 photographs. “SuperCool” has been shown at fifteen film festivals, including one in Serbia and several in Germany. Skhizein (Jeremy Clapin, France, 2008) was the closing movie for the night. It explored the reality of the individual who is removed from himself, from his ‘previous self’, or ‘previous’ reality…by 92 centimeters. If we ever thought that we were going crazy, we probably felt at a distance from ourselves and from our ordinary, everyday reality. The piece looks at how and whether we cope with that and other strange feelings. I urge readers to undergo the experience for themselves. I am looking forward to enjoying many more TOONights at ECLA, especially because Jelena and Irina are working on organizing two more events. Hopefully, we will have the opportunity to see answers to questions we never thought of, or we never dared to pose because they seemed childish. Maybe we will allow ourselves to be childish from time to time and adopt a much more fun yet still, I believe, profound perspective on reality.